8/02/12 – Acquisitions – Los Angeles, The J. Paul Getty Museum – The Getty has just announced the acquisition of two very different works. One is a 16th century German panel, the other an 18th century French drawing. However, both are of the finest quality. The painting, representing the Trinity surrounded by the Virgin, saints and a donor (ill. 1) had been shown in New York at the Richard Feigen gallery by the London dealer Sam Fogg in an exhibition which ended last 27 January . It was presented as being the only known panel of the Master of the Drapery Studies (also called the Master of the Rounds of Cobourg), a stained-glass painter active in Strasbourg in the second half of the 15th century and many of whose drawings are held in collections. Today, the Getty attributes it to the studio of Peter Hemmel von Andlau, the most important master glass artist active in Strasbourg at that time. The lack of other acknowledged paintings and the doubts concerning the attributions to this second artist, however, call for extra caution in pronouncing his name. 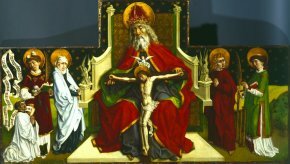 The only thing that has been ascertained for sure is that this Holy Trinity was painted in Strasbourg at the end of the 15th century. The second work is a drawing by Jean-Honoré Fragonard, purchased at Wildenstein’s in New York, which represents a family scene where a mother is preparing crepes for her many children (ill. 2). Dated 1782, the sheet is typical of the whirling art of the French painter, a virtuoso in his manner of first tracing the sketch in black chalk on which he then seems to slap black ink stains, a deceptively spontaneous style that is in fact a result of a thorough reflection. 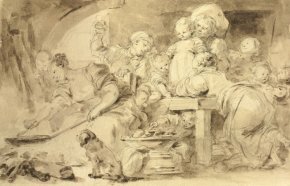 The Getty Museum already owned other works by Fragonard : a painting, The Fountain of Love, and two drawings : a red chalk landscape representing The Ruins of an Imperial Palace in Rome and a courtly scene (Oh, If Only He Were As Faithful To Me), in an identical technique as the one recently acquired. Readers can consult Paul Jeromack’s review on artnet.com. Previous article in News Items : PLU of Versailles : City Hall’s First Concessions ?